Christian Bauer and Eddie Chew are old hands at turning dining into a form of escapism. 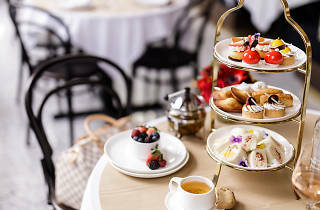 At Troika Sky Dining, you’re lifted from the hustling streets of KL as you dine on pastas, cheeses and caviar on the 24th floor; at Mr Chew’s Chino Latino Bar, you’re whisked to an otherworldly realm at the top floor of WOLO Bukit Bintang, where Latin-American and Oriental cultures merge to create dishes like catfish char siew, nori tacos and salmon ceviche with garlic-infused soy sauce. 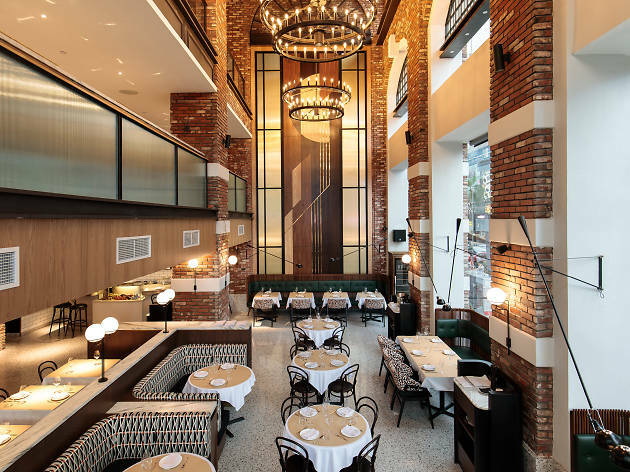 The duo’s latest venture, Brasserie Fritz, is a similar attempt; this time drawing you away from the daily grind of Jalan Bukit Bintang to a fashionable Parisian street. 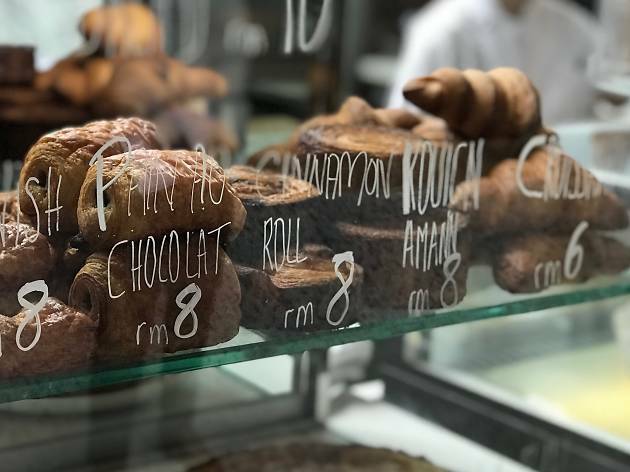 The experience starts from the moment you step past its doors: freshly baked croissants, kouign-amanns and pain au chocolats greet you from as early as 7am, while a waiter in a creaseless white shirt and clipped tie stands ready to explain the menu and plat du jour. 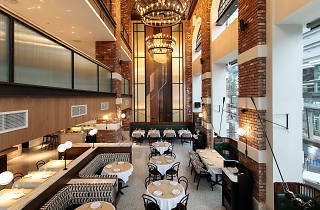 Inside, the two-storey high space is filled with tables and chairs that wouldn’t look out of place in a modern bistro, complete with a long bar that offers a slew of day-drinking spritzes and Bloody Marys. 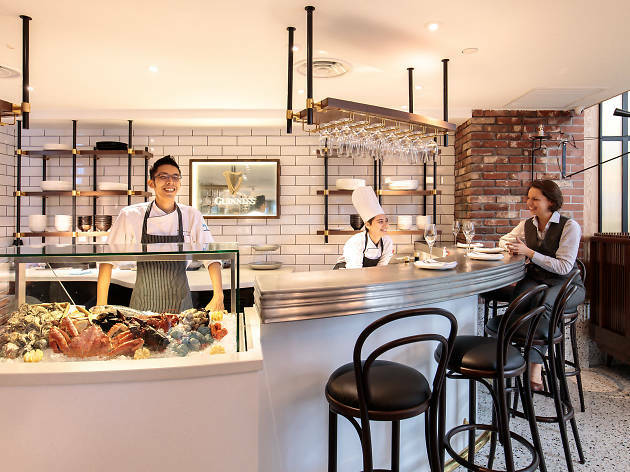 Further in is a seafood bar stocked with produce from around the world – oysters, king crabs, scallops, sea urchin, caviar – that are displayed in all their exotic glory. Upstairs is yet another bar, offering cocktails in a lounge environment during the evening. 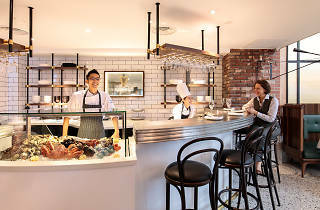 The ambitious menu spans from Melbourne-influenced breakfasts (avocado toast included) to European-style sharing plates and mains to Japanese-inspired seafood dishes. 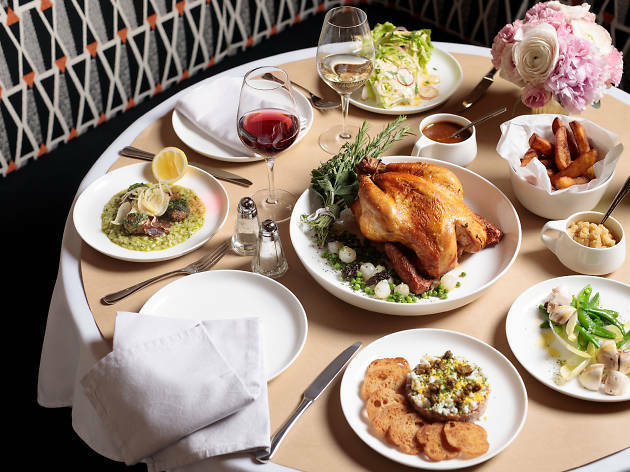 For those at a loss of where to start, they recommend the three-course plat du jour (RM65) – a simple, uncomplicated affair; the meals here aren’t made to wow you as much as offer you a short reprieve before you head back out into the real world. For mains, choices range from light meals like moules maison (mussels in tarragon broth served with potatoes, choucroute and mustard; RM38) and Stingray Nage (served with mussels, burnt baby leeks, celery, carrot and green zucchini; RM45) to more substantial French classics like duck confit (RM62), steak frites (RM98) and beef bourguignon (RM58). We particularly liked the Asian-inspired Fish & Chips (RM75) – two pieces of cod cooked with thosai batter, with a light dusting of tandoori spices that complement the subtle oiliness of the fish. The six-seater seafood bar is helmed by chef Steve Ariffin, who uses his expertise gained as Cantaloupe’s Chef de Cuisine to create a six- to eight-course omakase meal (RM160++) that sees air-flown Japanese ingredients prepared using European cooking techniques. The omakase dishes change almost every day, but a peek at the daily menu’s seafood section offers hints: uni served with carrot mousse, rosewater jelly and caviar (RM55); and oysters with smoked duck custard and orange oil (RM37) are just a few of the dozen dishes regularly offered. At the bar, you’ll find several day-drinking options that include all-day spritzes (RM32 each) such as the Paolo (sweet vermouth, amaro, Campari and soda) and Hugo (mint, elderflower, dry vermouth and sparkling wine). Those who want a boozy start to the weekend (or any morning) can choose from their selection of Bloody Marys (RM38) that includes an Extra Savoury (made with whisky and duck bacon), Light & Refreshing (gin and yuzu), and With A Kick (mezcal and pineapple salsa). 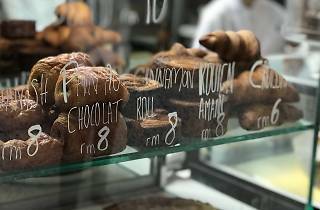 Booze-free specialties include hot chocolate drinks (RM18) that use single origin cocoa from Brazil, Ecuador and Tanzania. If you’re feeling a little rich, go for the 70% Cocoa (RM28), which is made using beans from Damak, Pahang that are fermented for six days in ex-Glenfiddich barrels to produce a creamy, well-rounded cup of hot chocolate. A meal here doesn’t come cheap; RM70-150 per person, inclusive of drinks, is the pretty price you have to pay for a bit of escapism. 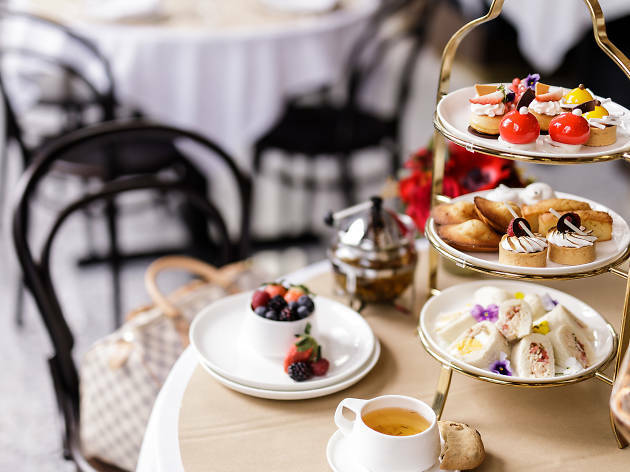 But it’s a meal worth indulging in, especially if you don’t get out of the city often enough. Service, was great maybe because the place was empty so we had full attention of the waiters. Cocktail, well I tried 1 the Martinez. Location, Cannot get any better the no 1 address in KL. Food,Tried the Prawn a la plancha, Fois gras,Fish and chips, Steak frites and roast cauliflower. Prawns and Steak were good but the rest awful. The fois gras, chips and frites were tasteless, seemed they were cooked from frozen. The Cauliflower seems to have come out of a sack of coriander seeds, ended up tapping it on the plate and picking the seeds out, the steak covered with way too much garlic butter and the fish batter flavoring overpowering. 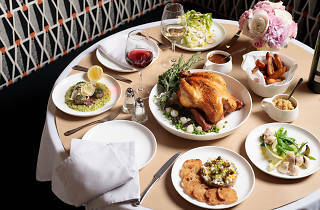 Altogether the ambitious menu just causes chaos on the palate. Your money is better spent upstairs at Mr Chews, or The French Feast (10 mins) for fois gras or The magnificent fish and chips (10 mins) for fish and and really good chips.